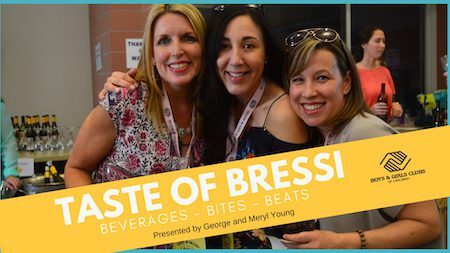 (Carlsbad, CA – February 12, 2019) The 8th Annual Taste of Bressi is a high-energy, good times afternoon jam-packed with adult beverages (beer to wine to distilled spirits), bites, and beats. And to top it off, no guilt as all of the proceeds benefit the Boys & Girls Clubs of Carlsbad. Serving some of San Diego’s finest ales, lagers, wines, and all sorts of spirits will be 20 plus adult beverage vendors. In addition, an array of local restaurants will be in attendance passing out taste treats. Restaurants, breweries, wineries, and distilleries are being added daily – an up-to-date list of all the participants and can be found on the event website. The $55 Clubhouse Pass provides your choice of eight beer or wine tastings – ten if you register before March 1 – plus all restaurant offerings. In between eating and drinking, explore the Clubhouse, play some games, and listen to two great local bands on the patio – Fechez la Vache and Naked Saturdays – as well as a DJ who will be spinning upbeat tunes all afternoon in the gym. Our Title Sponsors, George and Meryl Young, are longtime Carlsbad residents. George is a Boys and Girls Clubs National Trustee, and serves on the Carlsbad Board of Directors. Funded 100% by local donors, the Boys & Girls Clubs of Carlsbad has been enriching and inspiring the youth of the community for 67 years. The event takes place on Saturday, March 9, from 2-6 pm at the Boys & Girls Club’s Bressi Ranch Clubhouse located at 2730 Bressi Ranch Way, Carlsbad, CA 92009. This Festival is exclusively for those 21+ years old. For more information or to purchase tickets securely on-line, please visit www.bgccarlsbad.organd or call 760-444-4893.